Bathroom worktops can be created from stone, glass, wood, metal, conglomerate, composite or can simply be laminated. 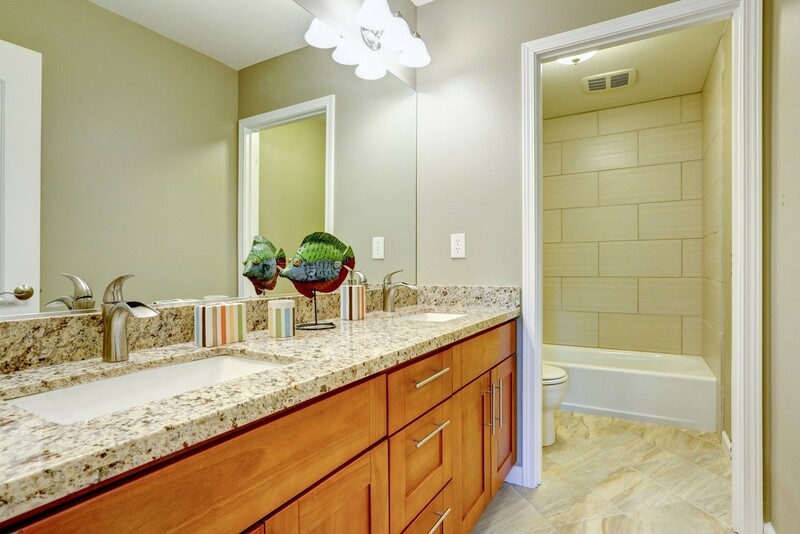 However, the best material for the bathroom is inevitably stone – most commonly worktops and bathroom tops are made of granite or marble, as these are the best natural stone for construction and decorative purposes. This is mainly due to its appearance, nobility and prestige. It is a beautiful addition to the bathroom, it is easy to clean and leaves an impression of high personal hygiene. Stone is not easily damaged, it is certainly resistant to acids and chemicals contained in cleaning agents, plus it is very difficult to scratch it. Among the stones on the market, granite and marble are the leaders. The former is considered as more exclusive and thus more expensive. The latter is cheaper, but that does not mean it is necessarily worse. Both are beautiful in their own way, with many attributes, such as water and high temperature resistance. They are very durable materials: quartzite and travertine are among them regarding those qualities. However, at the end of the day the stone is rather expensive and sometimes it may be our last choice. It is said that wood or laminated worktops are bad. Certainly, their resistance to humidity and other factors is weaker, but they are available in many colours and designs, and of course are easily kept clean. It’s simply a matter of choice – durable, more durable or the most durable and the difference between expensive/cheap. Glass worktops are also very unique, but you must be careful with their use and care. The bathroom is a very important place in the life of every family. We want to make it feel nice, cosy, safe, clean and fresh. This is the place most suitable for a stone worktop. Stone can please everyone, but not everyone can afford it. At a reasonable price wood worktops are sometimes a much wiser option, however, then there are other negatives which need to be considered. The decision is yours. If you are still not certain if granit eis a good material for your worktop, you can easily visit our headquarters in London, Kingsbridge Crescent. If you live nearby (let’s say, in the North London area) you are just a couple of minutes from our well-supplied warehouse full of exquisite stone materials used to create the best kitchen and bathroom worktops in the UK.